The Book Chook has a new favourite picture book. Isabella’s Garden has pushed its way into my heart and mind with beautiful, poetic writing, and eye-popping illustrations. 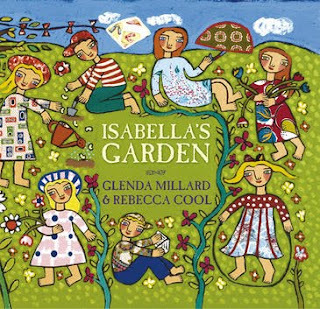 Written by Glenda Millard, illustrated by Rebecca Cool, and published by Walker Books Australia (2009), Isabella’s Garden is a stunning example of a cumulative story beautifully told by two master craftspeople. Rebecca Cool’s artwork is magical. The Book Chook has a penchant for folk art, and Cool is a master of this style. Her use of colour and pattern makes her illustrations fascinating, and kids will enjoy exploring and re-exploring all the visual details. As I write this review, I am actually in Margaret River, Western Australia. Rebecca Cool lives nearby, and I was lucky enough to see more of her work in the Margaret River Gallery. Cumulative stories like The House that Jack Built and There Was an Old Lady are great for beginning readers because their repeated text facilitates prediction. There IS repetition in Isabella’s Garden, but Glenda Millard also innovates as the seasons change, so youngsters will find the challenge of new and interesting vocabulary too. I am not familiar with Millard’s books, but will definitely be on the lookout for more by this talented Australian writer. Isabella’s Garden would make a wonderful springboard to doing some gardening activities with your kids. Ask them to use the book to discover what seeds need to grow into plants. Can children notice any of the book’s details in their own garden? Kids might enjoy designing their own garden patch, choosing seeds, and then digging, planting and tending until their seeds germinate. If you don’t have a patch of soil available, consider a container garden, or an experiment on seed germination. Encouraging kids to be observant and responsive to changes in the garden is a useful skill to develop, and can lead to a lifelong interest in the outdoors.